Exhibition view "Economies of the Imaginary", 2015, photo: Daniel Jarosch / Künstlerhaus Büchsenhausen. The participants in the International Fellowship Program for Art and Theory 2015–16 are granting insights into their projected work of the coming months. Opening (in the frame of the Start up Lectures 2015/16): Fri Oct 16, 2015, 7 p.m.
Tue, Wed 2 – 5 p.m.
Thu 10 a.m. – 5 p.m.
Andrea Bellu develops her artistic works as installations: writing, drawing, taking photographs and making films. She often works together with other artists and scientists. Starting out from post-colonial, migrant and feminist perspectives, she attempts to insert gaps and disruptions into the predominant narrations of history. From all this an intuitive, unfinished archive emerged, which the artist will investigate during her fellowship in Büchsenhausen. While traveling through Silesia, Galicia and Bukovina in 2014 and 2015, Andrea Bellu began to gather together material: pictures, conversations, landscapes, sunsets, literature. The route of travel encompassed an historical cultural sphere, in which different minorities lived alongside and with each other for centuries, without a national majority population. In many villages and towns the Jewish population constituted the biggest minority. This complex and multilayered cohabitation was put to a cruel end by German occupation and the German politics of annihilation during the Second World War. Andrea Bellu’s prime concern is to connect the frequently recounted and described, violent history of the early 20th century to the present day, and to visualize its present, ever tangible effects and continuities. Benjamin Tiven Benjamin Tiven is an American filmmaker and writer. 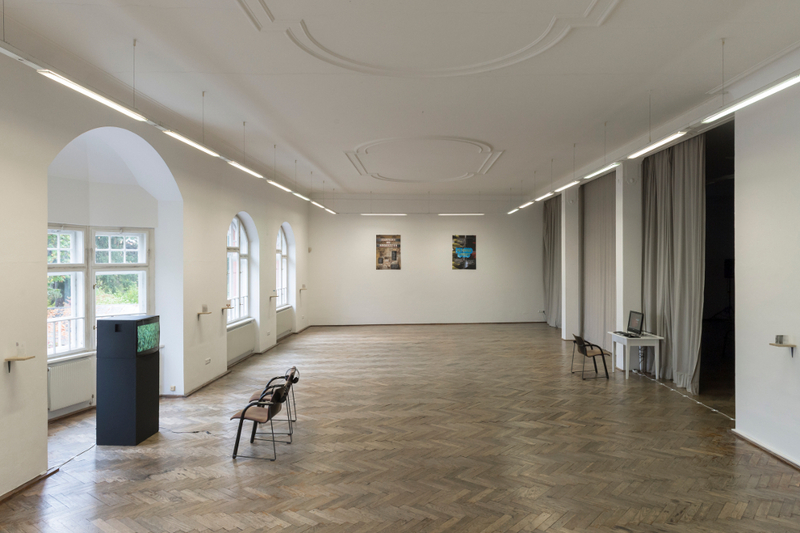 Recent exhibitions at the Institute of Contemporary Art, Philadelphia; Delfina Foundation, London; 1/9unosunove gallery, Rome, and Westfälischer Kunstverein, Münster. Films screened at the Viennale, FIDMarseille, Rotterdam, Oberhausen, and Arsenale Cinema, Berlin. Recent publications: Scrim Sinews (Cura Books, 2015), and contributions to the journals Triple Canopy, Bidoun, and Bulletins of the Serving Library. The film A Third Version of the Imaginary traces an encounter with the video and film library of the Kenya Broadcasting Corporation in Nairobi. We follow the station’s librarian through tightly-packed shelves of video cassettes: he is searching for a specific set of images, and must sift through the identifying paperwork from a number of tapes. As he methodically moves among the stacks, a Swahili voice-over speaks about the arrival of video technology in Kenya and its impact on the archiving of television images: video may have cheapened production, but its material expense put pressure on storage. Later, the librarian converts a basement storage closet into a makeshift cinema, to screen some recovered 16mm film material. The voice-over shifts accordingly, from video to film, and to the linguistic problem posed by the very word image in Swahili. A visual and narrative echo chamber, this video addresses video’s address of film. The material facts of these media become the aesthetic facts of the film. Fokus Grupa is an artist collective based in Rijeka, Croatia. Their work points to the social, economical and political frames of the art field. Their practice is collaborative and interdisciplinary, and they work across art, design and curating. Fokus Grupa concentrate on the relations between art and its public manifestations, in terms of working culture, aesthetics, and social and economic exchange values. Fokus Grupa is taking text samples out of a variety of sources from the Croatian national anthem to nature documentaries and tourist campaigns, in order to compose the narration layer of the film. Through various topographies, from open plains to mountain peaks, the camera explores the notions of the sublime, establishing it’s (critical) relationship to romanticism, and making a full circle, all the way back to contemporary (Croatian) nationalism. Perfect Lovers is an appropriation of Felix Gonzales-Torres work with an intervention, a redesign of the front side of two clocks into pie-charts. In Torres’s work two ready-made clocks inevitably go out of sync as time passes, illustrating a painfully simple allegory of love and partnership, while at the same time making a sharp critique of the heteronormative paradigm. In the case of Fokus Grupa the work approaches both the question of time and the idea of partnership, trough an economic lens. Here, the time is less a matter of meditation and more something to be measured, divided and instrumentalized. In an attempt to represent an ideal workday, which the 19th century proletarian desired; Eight hours labor, Eight hours recreation, Eight hours rest the required time has to span two clocks. Perfect Lovers fulfil the tasks of an effective worker. The function of their union is thus one of survival, essentially an economical one. Marina Vishmidt is a London-based writer occupied mainly with questions around art, labor and value. Anthony Iles is a writer of criticism and fiction based in London. Since 2009, Marina Vishmidt and Anthony Iles have been working together on a series of essays, posters and presentations expanding their common interest in the relation of artistic practices to social crisis by reflecting on the roles of machines, labor and value in capitalist reality and communist philosophy. To launch their project at Büchsenhausen Anthony Iles and Marina Vishmidt have worked with designers Paul Abbott and Alessandra Kila to make three posters which form graphic approximations of ‘processed value’ gathered from their working notes and image resources: ‘Ferment of Abolition’, ‘Seven Thousand Lean Years for Value’, ‘Petrified Unrest’. Fokus Grupa is an artist collective based in Rijeka, Croatia. Their work points to the social, economical and political frames of the art field. Their practice is collaborative and interdisciplinary, and they work across art, design and curating. Fokus Grupa concentrate on the relations between art and its public manifestations, in terms of working culture, aesthetics, and social and economic exchange values. They have exhibited in museums and venues internationally including: Offbiennale Budapest, Visual Culture Research Center, Kiev; A3bandas, Madrid; MACRO, Rome;, MCA, Ljubljana, MCA, Zagreb, Magazzino del Sale Venice; Calvert 22, London; Tranzit, Bratislava; Kunsthalle Exnergasse, Vienna; SKUC Gallery, Ljubljana; Miroslav Kraljević Gallery, Zagreb; Transmission Gallery, Glasgow. Benjamin Tiven is an American filmmaker and writer. Recent exhibitions at the Institute of Contemporary Art, Philadelphia; Delfina Foundation, London; 1/9unosunove gallery, Rome, and Westfälischer Kunstverein, Münster. Films screened at the Viennale, FIDMarseille, Rotterdam, Oberhausen, and Arsenale Cinema, Berlin. Recent publications: Scrim Sinews (Cura Books, 2015), and contributions to the journals Triple Canopy, Bidoun, and Bulletins of the Serving Library. Anthony Iles is a writer of criticism and fiction based in London. He is a PhD candidate at Middlesex University, a contributing editor with Mute / Metamute, http://metamute.org, and an editor of the forthcoming publication on writing and crisis Anguish Language (Archive Books), http://anguishlanguage.tumblr.com/. Marina Vishmidt is a London-based writer occupied mainly with questions around art, labor and value. She is the author of Speculation as a Mode of Production (Brill, early 2016) and A for Autonomy (with Kerstin Stakemeier) (Textem, 2015). She also works regularly with Anthony Iles and with Melanie Gilligan. She collaborates with artists and contributes to journals such as Mute, Afterall, Texte zur Kunst, and the South Atlantic Quarterly, as well as co-/edited collections and catalogs,most recently Anguish Language (Archive Books, forthcoming). She is part of the Theory faculty at the Dutch Art Institute, a visiting lecturer at Middlesex University and the University of Brighton, and has taught at the University of the Arts in Berlin, Central Saint Martins, and Goldsmiths.